Do you want to convert the songs downloaded from iTunes to other popular format, such as MP3, AAC, OGG and WAV formats? Do you even want to convert iTunes DRM-ed songs to plain MP3, AAC, WAV formats? When it comes to this question, many people have no idea how to convert plain and even DRM-ed music downloaded from iTunes to plain MP3, AAC and more formats. Here we introduce two ways to convert iTunes music to plain different file formats. Step 1. Open iTunes Preference. Step 2. Click the General button, then click the Importing Settings… button in the lower section of the window. Step 3. From the Import Using pop-up menu, choose the encoding format that you want to convert the song to, then click OK to save the settings. MP3/AAC/AIFF/WAV Encoder is available to choose. 1. If you convert between compressed formats (for example MP3 and AAC), you may notice a reduction in the sound quality. 2. You cannot convert older purchased songs, as they are encoded using a Protected AAC format that prevents them from being converted. If you need to convert these songs to another audio format, please refer to method two. NoteBurner iTunes DRM Audio Converter is a top iTunes Music Converter works on Windows and Mac platform, which is able to remove DRM from iTunes audio files downloaded from iTunes and convert them to various of common audio formats like MP3, AAC, FLAC or WAV format, and etc for playing on MP3 players, Android phones and tablets. Launch iTunes DRM Audio Converter on Mac. 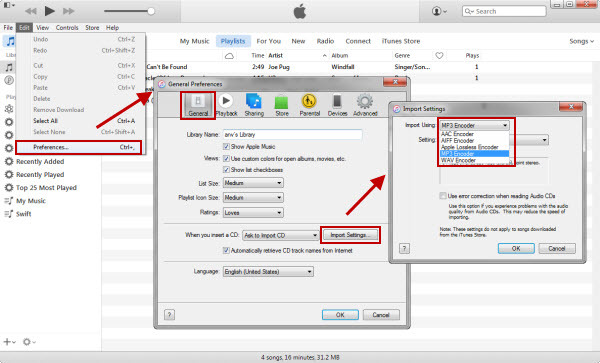 You will see the simple and intelligible interface of iTunes DRM Audio Converter. Click button, then you will see a pop-up window which will show you all the iTunes folders. You can add Apple Music files, audiobooks, and M4P audio in the pop-up window as you want. Click the menu bar "iTunes DRM Audio Converter > Preferences" or directly click button on the program interface, and then there will be a pop up window which allows you to set output path and output audio format. Output format as MP3, FLAC, WAV & AAC are available to choose. When finish customization, click "Convert" button to start convertion. If you don't want to convert a certain music, please click button to remove this music before converting. After conversion, you can click button to find the converted audio files. What's next? Download NoteBurner iTunes DRM Audio Converter now! How to Convert iTunes Audiobook to MP3 File Format?